Note: This is an add-on product to the KIBO Marker Extension Set. You must have a Marker Extension Set before you can use this add-on. 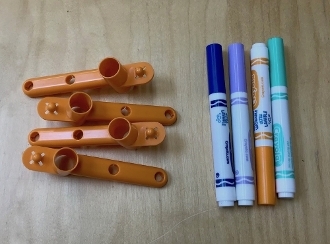 Extra arms and additional washable markers for the KIBO Marker Extension Set. Attach more markers at once and create longer "marker chains" with this add-on! The KIBO Marker Extension Set (sold separately) allows KIBO to draw as it moves! Attach the base to KIBO, then attach up to three arms to the base, and drop a marker into each arm. Let KIBO loose on a large sheet of paper, and KIBO will draw as it moves!